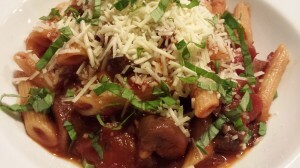 For that pepperoni pizza flavor in a pasta dish, try my Pepperoni Mushroom Pasta. 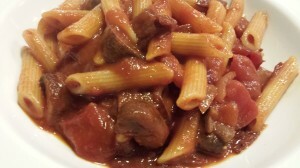 A simple sauce of pepperoni, mushrooms, sweet onion, garlic, red wine, diced tomatoes, Italian seasoning, and tomato sauce simmers while you heat the pasta water. 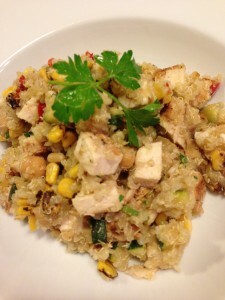 This is a simple weeknight dish that your family will love! For the penne pasta, heat some salted water in a large stock pot. Meanwhile, chop up your favorite pepperoni. Cut up some mushrooms. I used quartered cremini mushroom caps. 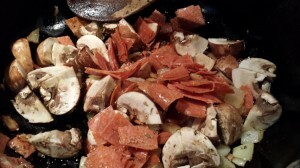 You could use chopped portabellas or sliced white mushrooms. Saute some diced onions and minced garlic with olive oil in a pan until the onions have sweated and are soft. 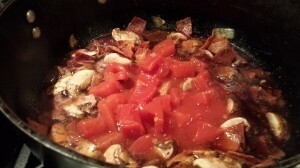 Add the pepperoni and mushrooms and cook until the mushrooms have softened slightly. Add some diced tomatoes, Italian seasoning and some red wine. Simmer for about 5 minutes. Add tomato sauce and some agave syrup and simmer for another 10 minutes. (The agave syrup will offset the acidity of the tomatoes.) 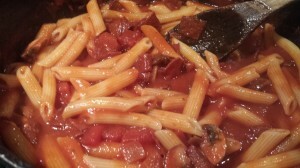 Add the cooked drained penne to the sauce and toss. Add some shredded Parmesan cheese and chopped fresh basil leaves. Serve! As a baked casserole option for a pot luck dinner, you could bake this pasta with a topping of mozzarella cheese. Just cook the pasta for 3/4 of its cooking time, drain, and mix with the prepared sauce in a baking dish. Add the cheese on top and bake at 350 degrees Fahrenheit for 30 minutes or until the pasta is hot and the cheese is brown and bubbling. After baking, top with the shredded Parmesan and chopped basil to serve. 1. In a large stockpot, heat lightly salted water to boiling. Cook the penne according to package directions. Drain, rinse, and set aside. 2. While the penne is cooking, saute the onion and garlic in olive oil over medium heat. 3. 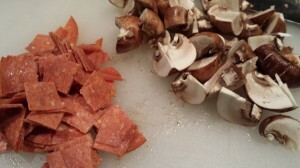 Once the onion is soft, add the pepperoni and mushroom caps. Saute until the mushrooms are slightly soft, about 5 minutes. 4. Add the diced tomatoes, red wine, and Italian seasoning. Simmer for 5 minutes. 5. Add the tomato sauce and agave syrup, cover, and simmer for about 10 minutes. 6. Add some salt to taste. Stir in the butter. 7. 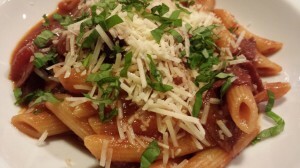 Add the drained penne pasta to the sauce. Toss. 8. Divide the pasta amongst the serving dishes. 9. Top with shredded Parmesan and chopped basil. Enjoy! Serves 4 as a main course or 8 as a pasta course. 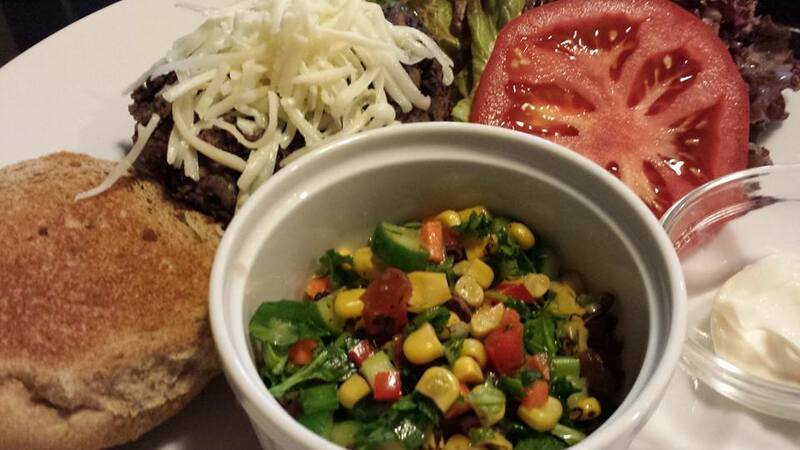 Serve with a side Caesar salad and some toasty garlic bread. 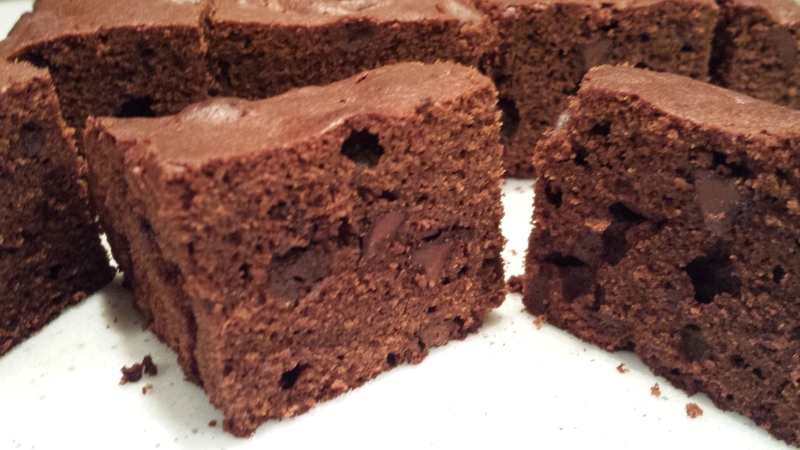 A nice dry red wine pairs well with this dish. Variations: Use gluten-free pasta. Add some sliced black olives, diced red bell pepper, or even some Italian sausage. Offer as a baked pasta dish topped with melty cheese.